The military says troops deployed in Operation Lafiya Dole to conduct counter-terrorism and counter-insurgency operations in the North East have killed four suspected members of the Boko Haram terrorist group. The Defence Headquarters in a statement on Wednesday revealed that the insurgents were neutralised during separate operations by soldiers in Borno State. 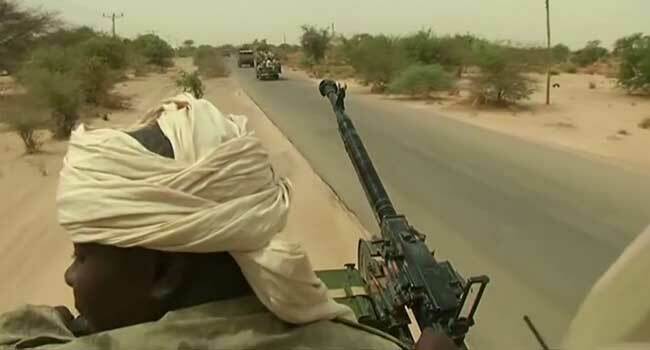 “Troops of 81 Division Task Force Battalion killed three insurgents on Tuesday in a failed ambush staged by the terrorists along Gulumba Gana – Masa – Dikwa Road in Dikwa Local Government Area of the state,” the statement read in part. The statement read further that the troops who were on a fighting patrol uncovered two Improvised Explosive Devices (IEDs) buried in the ground along the road by the terrorists prior to the ambush. “While the troops carried out counter IED actions to disarm the explosives, the insurgents sprang the ambush but met with fierce resistance by the troops, who swiftly countered the ambush, killing three of the insurgents while others fled with gunshot wounds,” it said. The troops also recovered two AK 47 rifles, one Light Machine Gun and an empty magazine from the terrorists while a soldier who sustained an injury during the encounter was already receiving medical attention. In a separate operation also conducted on Tuesday, troops of 3 Battalion successfully staged an ambush against insurgents at a crossing point behind Ngala town in Borno. One of the insurgents was killed in the process while the soldiers recovered one AK 47 rifle and seven rounds of 7.62 MM ammunition. Other terrorists were said to have fled with gunshot wounds following their encounter with the troops. The military has called on residents in the state to report persons with gunshot wounds seeking medical attention to the security agencies.